One of a series of three portraits of Great-Grandma McNary — Jane Campbell McNary, front & center — and all her descendants and their spouses. 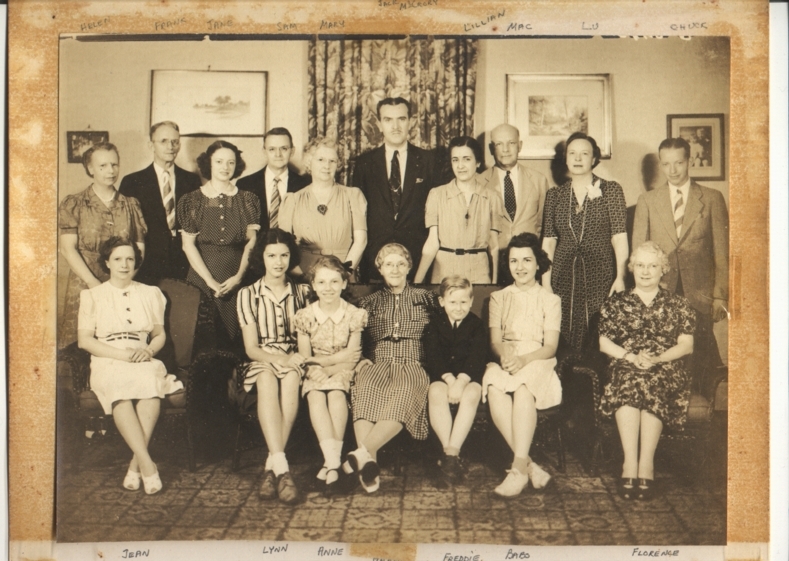 Her daughter, my grandmother Florence Rex, sits on the right end of the front row; her son Charles, my Uncle Chuck, stands behind her; in the back row, second from left, is Florence's husband Frank C Rex, next to my mother Jane, third from left. A family portrait similar to the one above, this one of David C Rex (top row, far right), his grown children, and their spouses. 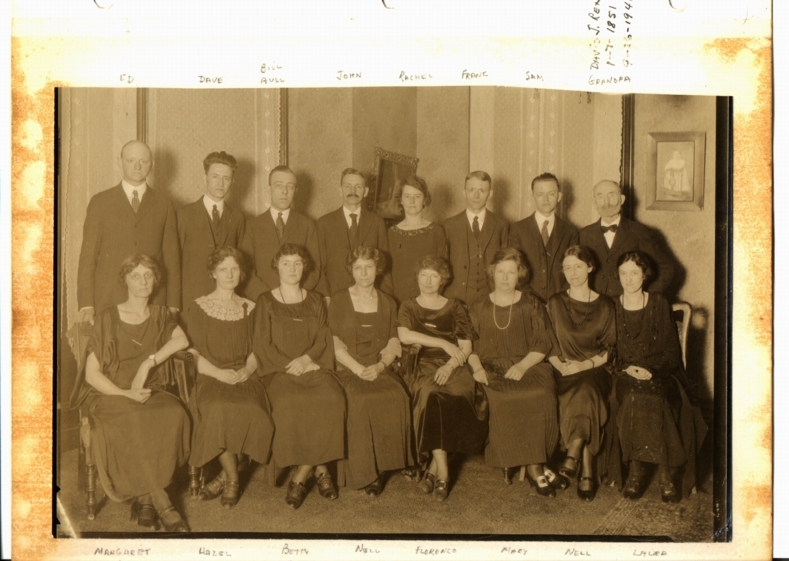 My mother's father Frank C Rex stands third from right in the top row; his wife Florence sits in front and to his right, with the darker dress and come-hither slouch. 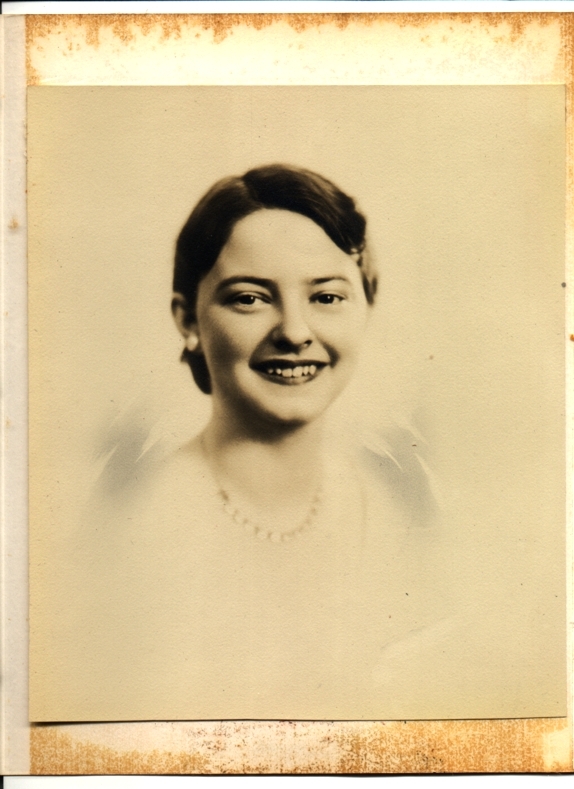 I'm really bowled over by what a looker my Mom-mom is, especially in the small cameo in the center. Frank tried to change his major to music after his first year at Allegheny College (my alma mater), around 1900; the old man's answer to that was to jerk him out of school altogether and put him to work in the box factory he owned. On the left, my mom looks about 2, so that dates the photo around 1916. On the right we see Chuck at the same age, and Florence's hair appears to be long, so it's probably 1912 or so. The man driving could well be her father, Edward McClure McNary, who would have been about 55 at the time. The house behind them to the left is 442 Union Avenue in Ingram, PA — where they lived until the early 1960s, and in which my mother was born. 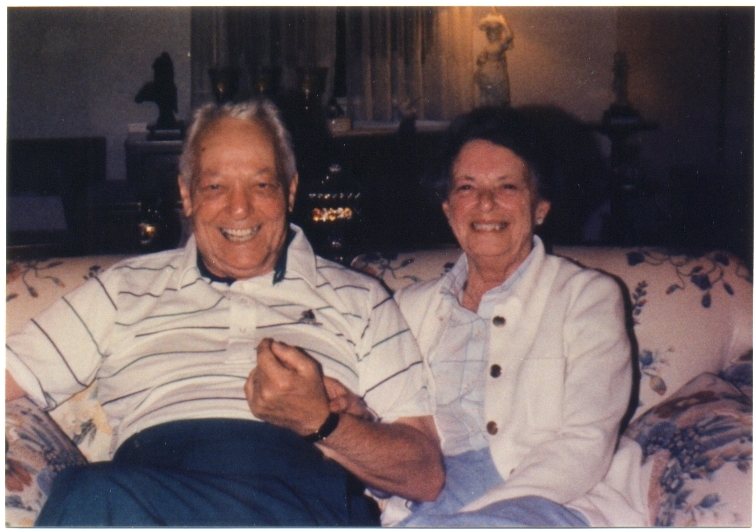 This is how I remember my Mom-mom and Pop-pop looked when I was a kid. Notice the new awnings and shrubbery at 442 Union Ave. 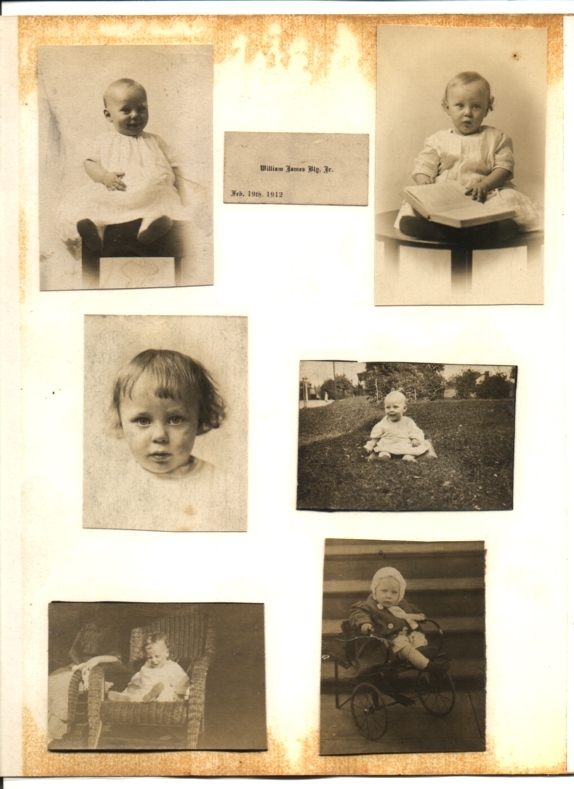 I don't know who the baby is that Florence is holding top right — could be me or more likely my sister Lynn, if it's not some cousin or even neighbor kid. 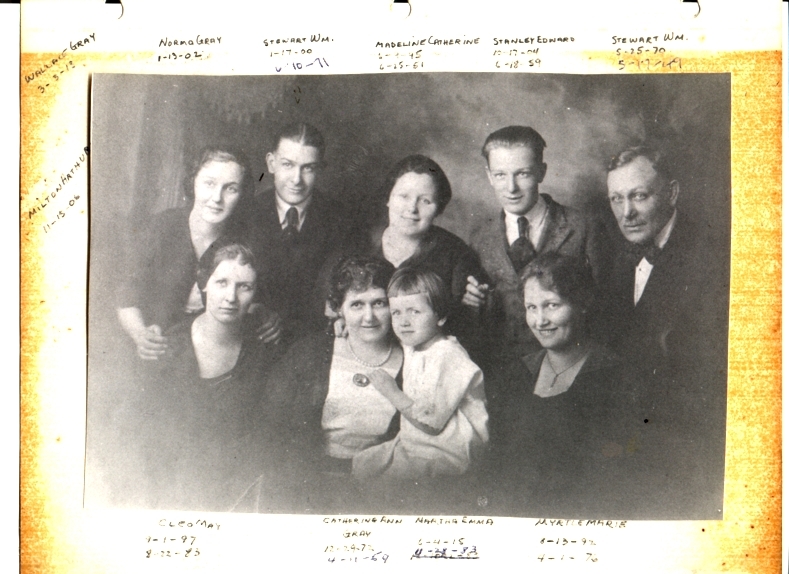 I say c1920 on the basis of how old Martha (the youngest, in Catherine's arms, down center) appears — she had the distinction of being 4 years younger than her nephew, my father (WJBlyJr), who was born in 1912. Dad's mother, my grandmother Madeline, smiles sweetly just behind them. On either side of Catherine are the two great-aunts I knew best: Cleo ("Aunt Coe") on the left and Myrtle on the right. Together with Norma, who stands behind Cleo with her hands on her shoulders, the four oldest Hamilton girls constituted the "Beef Trust" — at one point the four of them together weighed 1000 pounds. 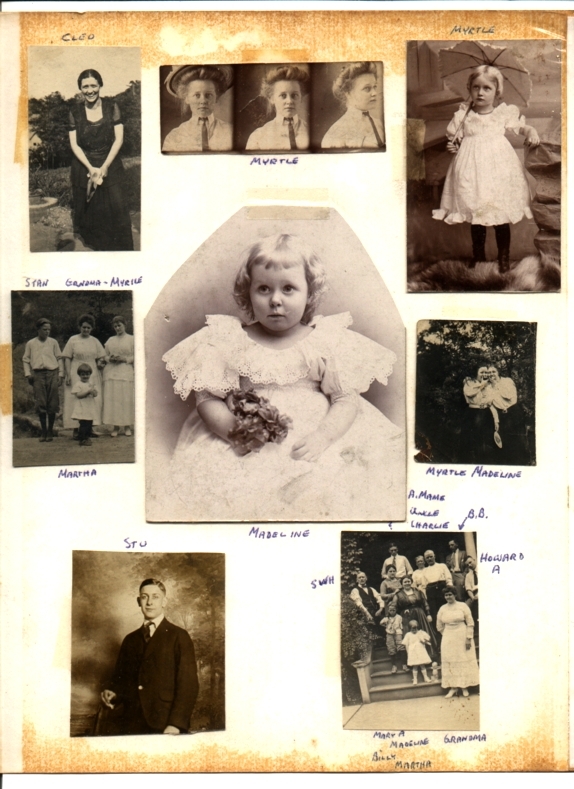 My favorite picture of my grandmother Madeline, whom I really don't remember (she died when I was 3), is in the center, and the same with Myrtle and her parasol upper right. I can almost hear Coe's chesty laugh in the photo upper left — it was unforgettable and utterly infectious — though I never knew her when she was so skinny. 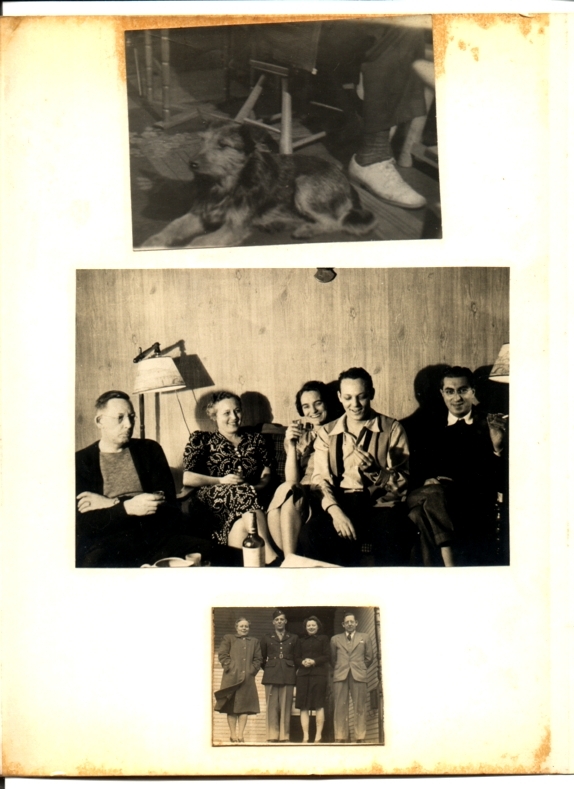 My grandfather Pop Bly (WJBlySr) appears in the upper right of the photo lower right — which means he must have been a-courting Madeline, if they weren't in fact already married. Neville Island is a cigar-shaped island in the middle of the Ohio River just below Pittsburgh, and before it was completely taken over by industry seems to have been a great place to camp and picnic, according to my Dad (WJBlyJr), seen saucily leaning on what might be a shovel lower left. That's my grandfather behind him to the left in what looks like a Twilite Camp tank top. 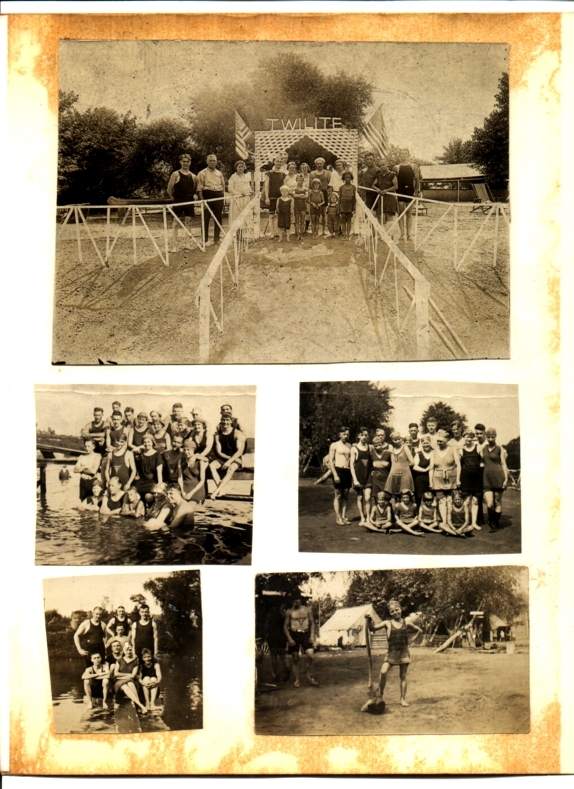 In other photos at camp you can see that Pop Bly was capable of serious fun if necessary. 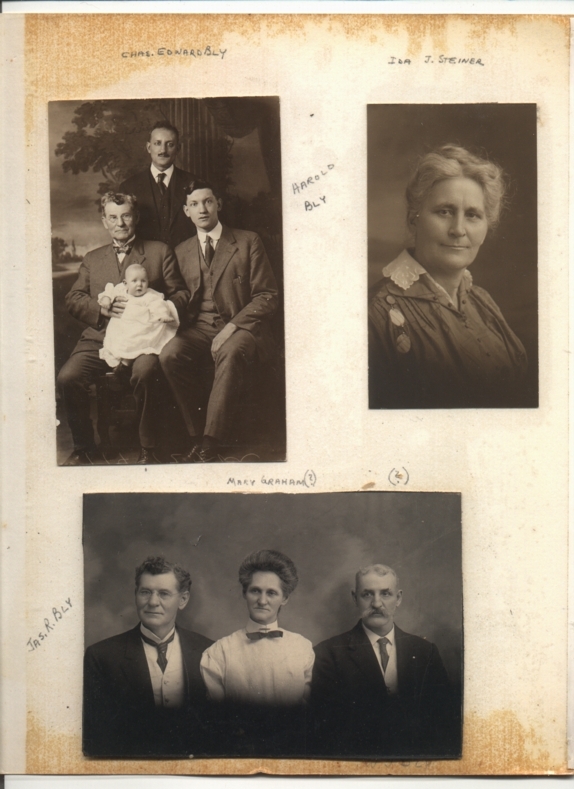 The upper left photo shows 4 generations: James R Bly, my Dad's paternal grandfather, his son Charles Edward, his grandson Harold, and Harold's unidentified babby. 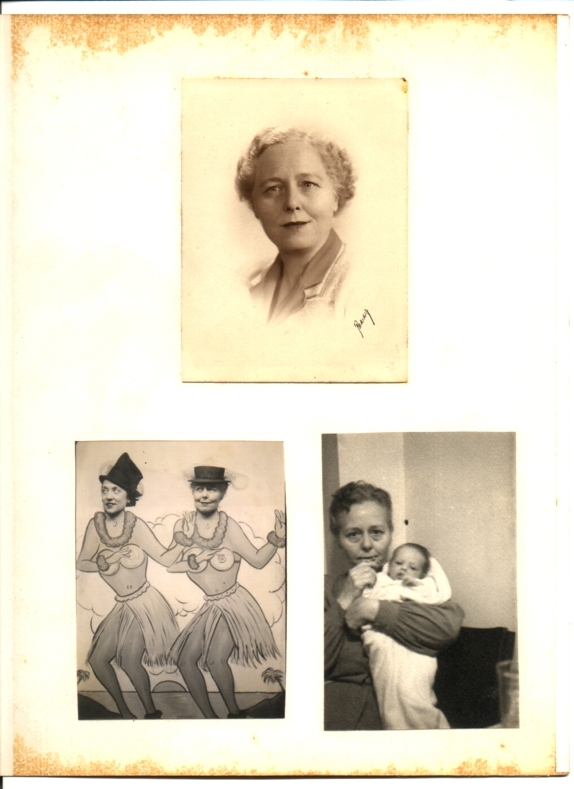 Upper right is Ida Steiner, JasRBly's second wife, the one my Dad remembered. 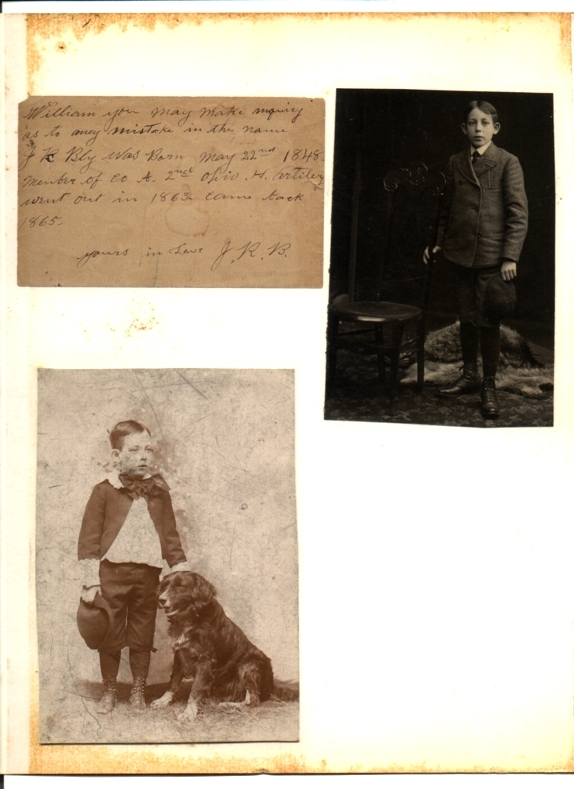 In the lower photograph, James R poses with two mysteries: my Dad thought the woman might have been Mary Graham, JasRBly's first wife and mother of his father — if so, it's the only photograph of her we have (but doesn't she look a lot like the boys on either side? especially the nose? 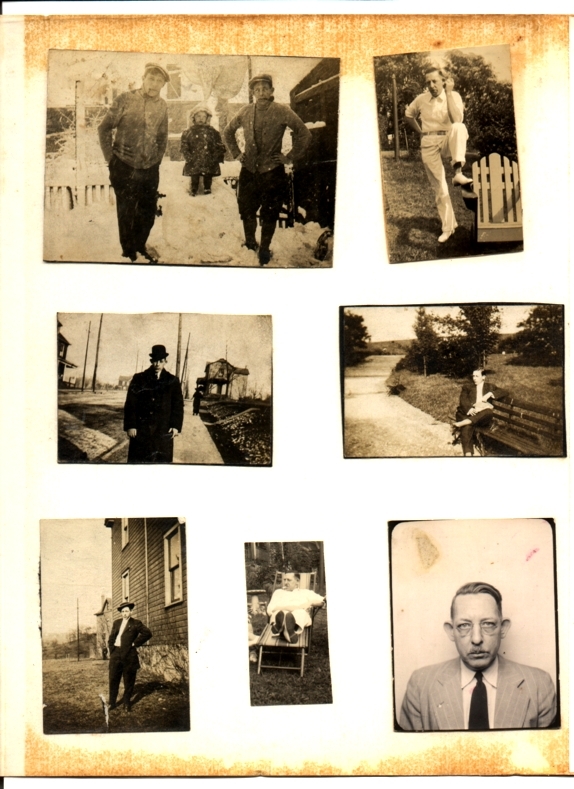 ); the other is William J (or BJ) Bly, likely James R's brother, who appears as an older man in another photo in the album, and who may have been my grandfather's namesake. 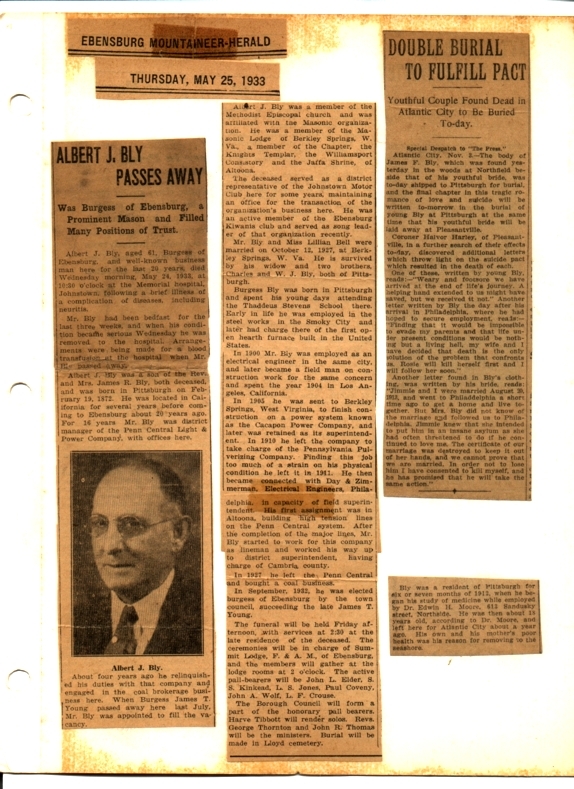 A family legend, uncorroborated — Jimmie Bly, the young husband in the tragic tale in the clipping on the right, was (or so my father thought) his uncle Ab's son, hence the juxtaposition with Albert Bly's obituary. There was another clipping about the double suicide loose in this album as Dad was putting it together — lost now, alas — describing their ordeal in harrowing detail, and providing a forceful portrait of "the formidable Mrs. Bly" who pursued them across Pennsylvania and was on the verge of catching up to them when they dodged into death in the woods outside Atlantic City. 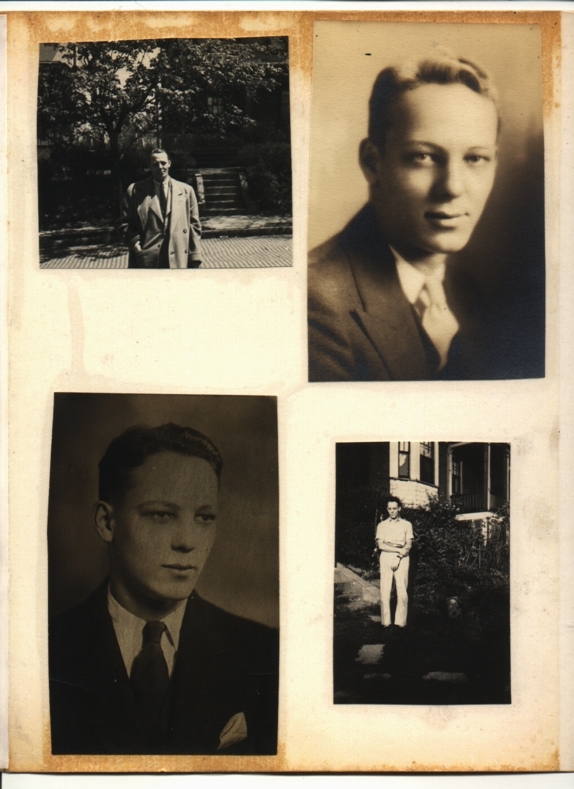 The earliest photos of my grandfather WJBly (Pop Bly), providing the only artifact I've found in the archives concretely linking him with his father: the note concerning "my mistake in the name" — which could refer to the spelling of James R's middle name, "Robenson" in one document. 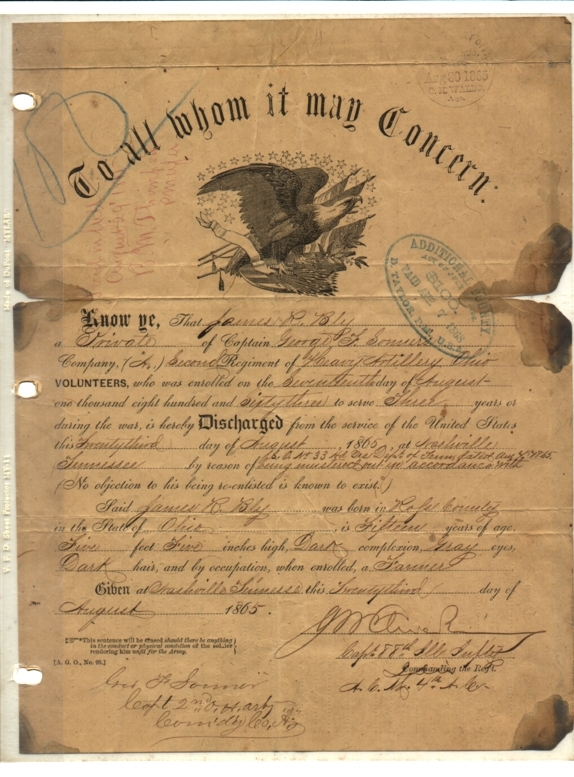 The birthdate James R gives here, however, is questionable — the death certificate gives it as 1849 — and may have been "modified" in order to permit him to enlist in the Union Army, minimum age 15 at the time. The dog's name will probably always be a mystery. 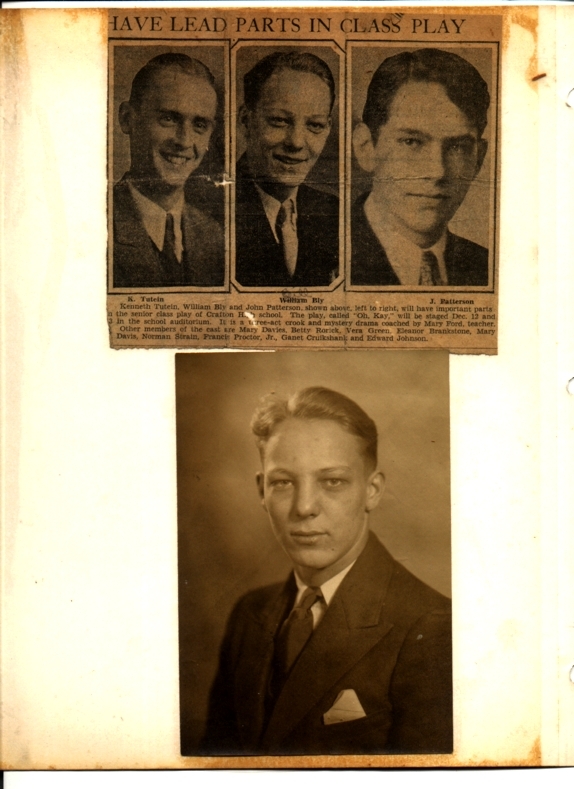 Multiple photos of WJ Bly as a young man, except for the haunting arcade portrait lower right, which my Dad describes as how Pop Bly looked when he was bookkeeper at Fort Pitt Hardware Co of 807 Liberty Avenue in Pittsburgh — where his son later became Vice-President, and his unknown grandson (he died 2 years before I was born) joined the workforce as a shipping clerk the summer of the New York World's Fair. I think the dog's name was Buster. The middle photo would seem to have been taken on my father's 21st birthday — the legal drinking age in Pennsylvania even then — one has to wonder what Pop Bly's thinking.... The bottom photo shows the Bly side of the newlyweds' family, but they're standing on the steps of the Rex's house, 442 Union Avenue in Ingram again. Though Mom & Dad got married in February 1941, this could be as late as 1943, when Dad went overseas. Pop Bly and firstborn son, my father WJBlyJr, I think in the back yard and around their house at 7 (or 5) Lawson Avenue in Crafton, which sat atop a ferociously steep hill. The second down on the left could be Niagara Falls. I don't know the original volume this page comes from, though it looks like it could be a family bible. The hand is James R's — there also exists in the album what appears to be a draft of this page, with scratchouts and corrections. 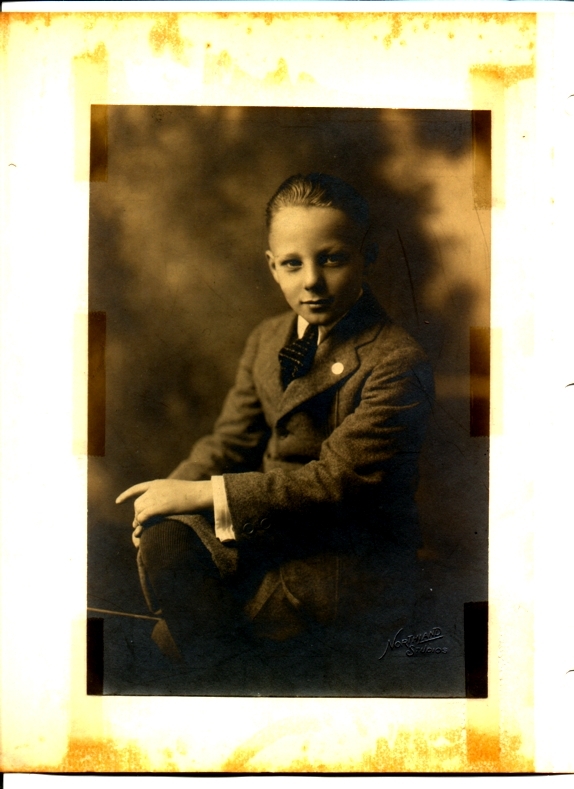 My grandfather WJBly appears to be the baby of the family. 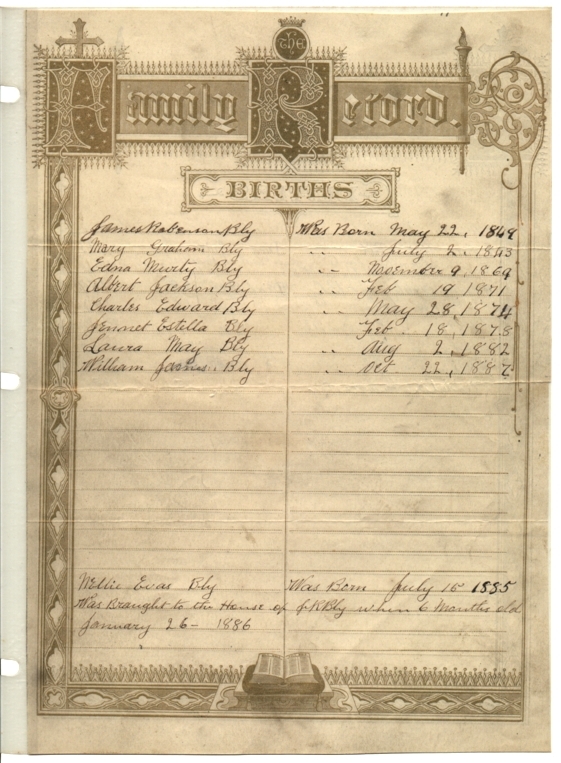 Jackson, WJBly's older brother Ab's middle name, comes from James R's father, Jackson Bly (1823-1865). 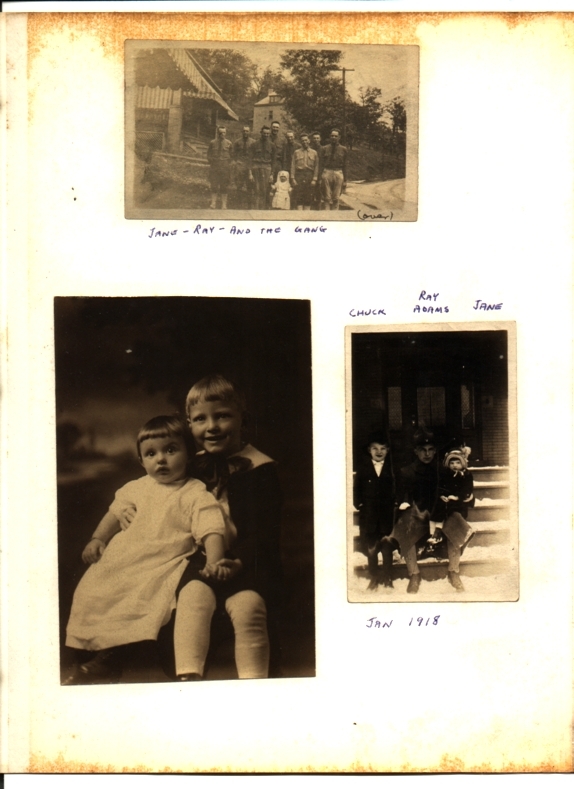 Note an earlier (though adopted) Nellie Bly in the family, at the bottom of the page. This is probably the oldest document in the archive, James R Bly's discharge papers from the Union Army at the end of the Civil War. 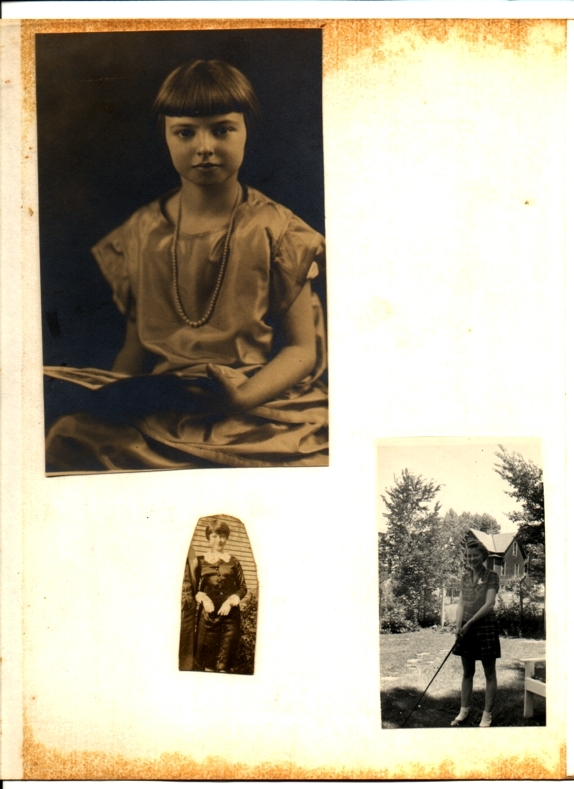 My grandmother Madeline here gets her gallery page as a grown-up. Don't know who the other hula maiden is with her in the lower left photo; the little bundle of sleep-deprivation in her arms lower right is me (WJBly3), some days old. From 1912-13. Notice the dress and long hair, still a custom for boys as well as girls up to school age — the dress would certainly be a logistical advantage in diaper changing! 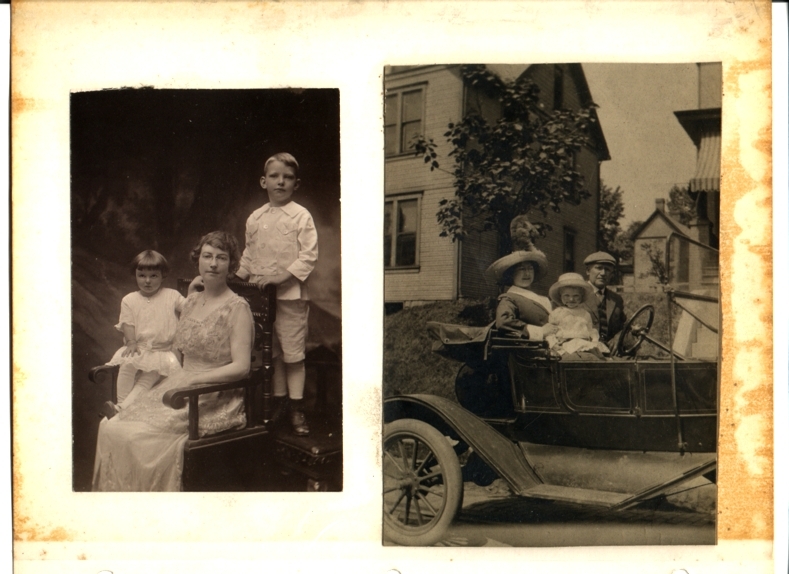 I also love the design of the stroller lower right: like a Model T, its contemporary. Don't know where this is; could be Camp Twilite — the river's pretty wide there. Great expression on Buried Boy upper left; in center, I believe that's his mom Madeline (based on the sweet smile) and grandma Hamilton, who also appears lower right with her youngest Martha, four years junior to her own nephew Billy Bly. Another custom of an earlier age: school-age boys wore short pants until they started high school (and puberty) at twelve. The suit is stunning, of course, but what I find most moving is the odd gesture of his left hand, the only sign of my dad's rambunctious spirit in an otherwise locked-in pose. I wasn't the first thespian in my family — Dad also played Andy Hardy in "Slipping" and the creepy guy with the picnic basket in "Night Must Fall" in high school. In what I think is his senior class picture at the bottom, the Hamilton dark circles under the eyes are beginning to show. In the picture upper left, I finally recognize the man I knew from my earliest memories. I have a wood block with an engraving of the dark photo beneath it — though it's tiny, no more than 2" x 3". It's possible that he stands in front of 7 (or 5) Lawson Avenue in Crafton in the one lower right. At the top, Baby Mary Jane is a miniature Florence Nightingale amidst the doughboys, one of whom is Ray Adams, who also appears lower right with Mom and her older brother Chuck. Ray had a room at 442 Union Avenue until his death (in the 1950s, I think) — I don't believe there was any family relation — and his beloved cocker spaniel Suzy figured with him in our nightly prayers: "God bless Mom-mom & Pop-pop & Suzy & Ray...."
Yet another picture of the steps in front of 442 Union Avenue in Ingram. Mom's at far left, tongue out; the two Aull girls on the right are the daughters of Frank's sister Betty Rex and her husband Bill Aull; Ruth Rex would be the daughter of John, Dave, or Ed Rex (check out the Rex family portrait). 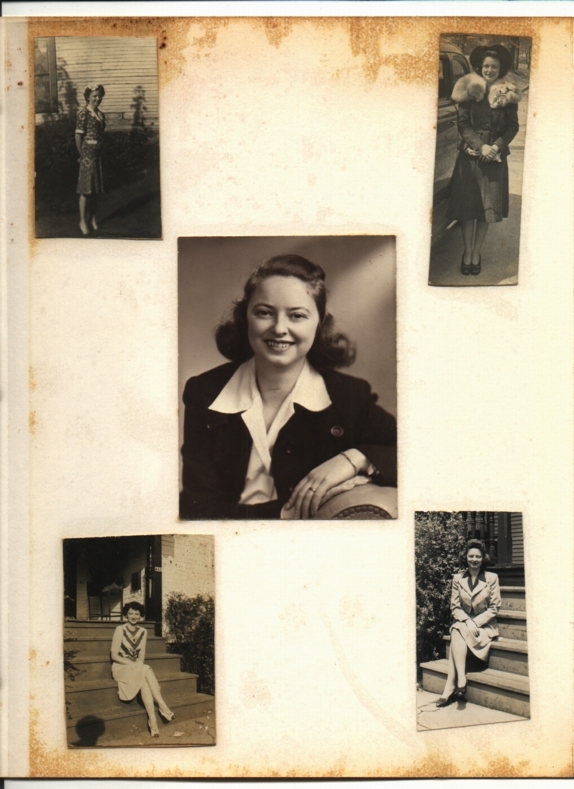 I never knew what Sam Ralston's relation to the family was, but his mother Esther appears in many photos with Mom-mom (Florence McNary Rex). 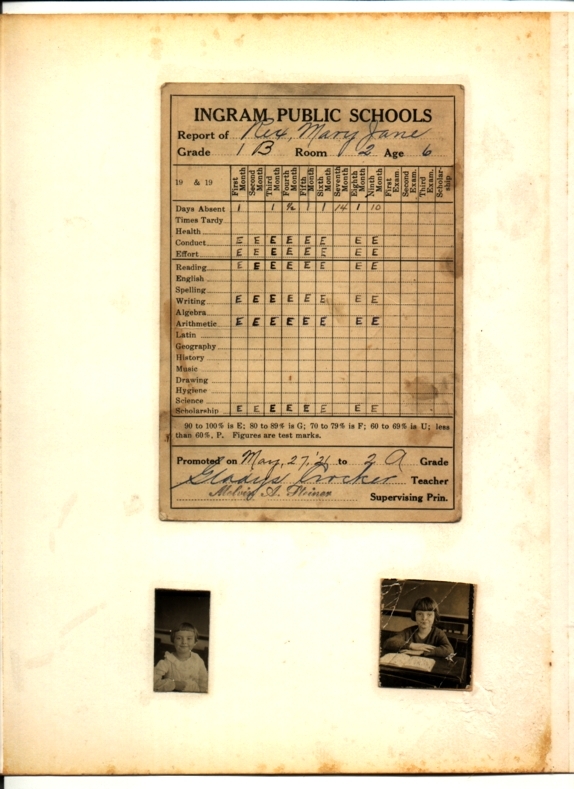 In the album there are 6 pages devoted to Mom's report cards (only 1 of Dad's survived), all with similar grades. Beneath are two early portraits of the teacher's pet. I find the shiny "Pilgrim" outfit in the small pic beneath the formal book portrait fascinating — and I'm not sure I'd recognize her out of context. In the other photo, Mom practices in the back yard at 442 Union Avenue; she was a terrible golfer, but loved playing the game all her life. One of the last things we ever did together was play nine holes — bad as she was, she beat me! I found "Poogie" written under her name on several items of Mom's popular sheet music. I pronounce the "g" soft (i.e., poodgie), but never heard Mom say it, so I don't know if that's right. I guess she's about 16 here. Gotta be my favorite. In the two left photos you can see how tiny she was (at 5'-1/2" she couldn't have weighed 100 pounds); again, the background is 442 Union Avenue. 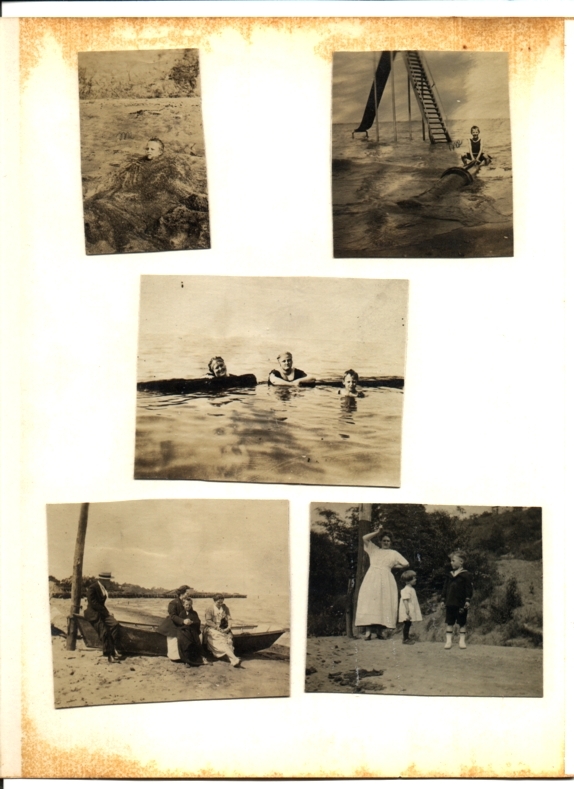 In the middle photo I can see Mom as I remember her when I was a kid. (Not from DodoPix.) Dad and Mom at a friend's house, or, more likely, in some hotel or residence lobby where they stayed on one of their frequent golf junkets. If you want to know why Dad did all this, just look at this picture.